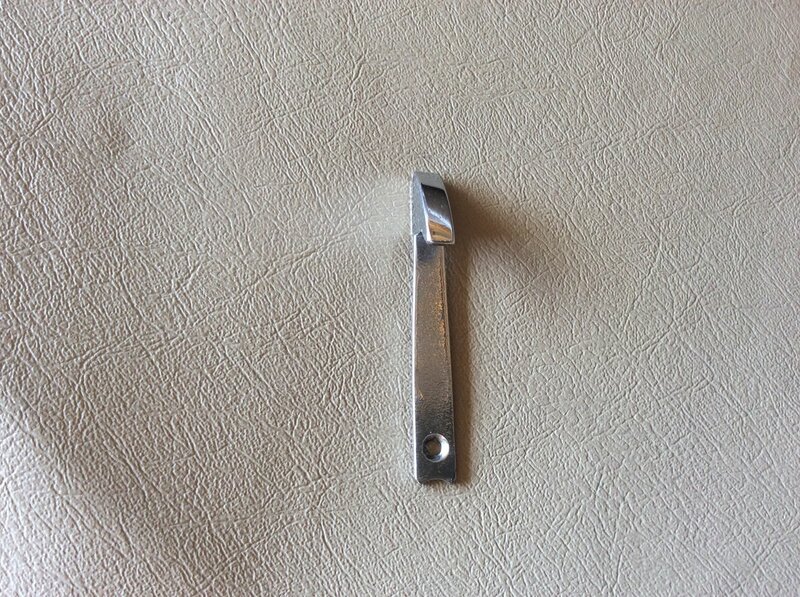 Have been trying to remove the steering control head to repair the indicator lever which came off in my hand. I have managed to remove the 3 grub screws in the head but can’t actually open the control head and need to get inside in order to fix the chromed indicator lever back in place. Can’t find any detail in manufacturers manual or Moss catalogue on how to get the head apart. Has anyone done this before and could talk me through it as I’m reluctant to put too much pressure on control unit to prise it apart. The lever is presumably held in place by a small screw which has again, presumably, fallen out and is inside the steering head. Thanks. Cars Owned::Assistant Director of New England Triumphs. I could be mistaken but I think you will need to completely remove the control head with the stator tube to get access to all of the screws that hold the control head together. carefully lift the whole assembly (control head plus a thin pipe of the length of the whole steering tube) out of the car. Typically the wires have to fed into the tube, in order not to looese the bullet pins. Then can can put it on the bench and start the disassembly…. You do not need to drain the steering box, or even touch the nut on the bottom of it. then release the 3 grub screw on the rear of the steering wheel hub, you don't need to take them right out, but wont harm to do so. gently pull the steering head away from the wheel, it will come away, pulling the wires with it, but leaving the stator tube where it was. When you have pulled it far enough to allow, start to dismantle the head and you should then be able to access the screw you need to get to. No wires need to be disconnected at the head, but you may have to do so at the other end if there is insufficient slack in them. I had mine apart last week. With a bit of luck you will not need to dissemble completely. First remove the 3 large screws on the back. This will separate the “Large discs” that make up the control head. You will then be able to see where the screw goes that holds the lever in. IF AT ALL POSSIBLE DO NOT SEPARATE THE TWO HALVES OF THE “SMALLER DISC”. If you have to do this then you will spend most of the night swearing trying to get it back together again. This is the time that springs have to be pushed in and stand a good chance of flying out again before you can screw it all back up. If you do need to separate the two halves of the smaller disc then you need to remove the two screws that go through the horn contacts, plus another similar one. While apart you can clean up the horn contacts and also the copper ring on the underside of the horn push. This copper disc is a bit strange. It just sits in a recess in the horn push with no visible means of staying there. As I cleaned mine it fell out and no matter what I did it would not go back into the push without falling out again. Eventually I used double-sided tape, but I know that is not how it was designed. Better than dismantling it on the dining room table is to dismantle it on the dining room table inside a large polythene bag. It has small springs in compression inside and can just explode sending small bits in every direction. I had to re-manufacture the small brass roller that holds it in detent (is that the right word?) after mine came apart during the process. And when you come to sell your house you will find that small brass roller wedged between the skirting board and the floorboards in the far corner of the dining room. That "small brass roller" is held in compression by an even smaller spring. Mine was rusted away, and I has to modify an old Biro spring to replace it. Very many thanks to all. I am constantly amazed by the kindness and generosity of other Register members. I will get to work on Monday. No such luck Charlie. We have sold the house and moved on but the small brass wheel never reappeared. I have got down to level 2 on the control head.......and all is not well. Some pieces of Bakelite are broken off and missing and probably more of the mechanism. The wiring is shot and will need replacing. In any event the steering is as heavy as the titanic and as loose as you can get. Rimer appear to do an aftermarket replacement for both the control head and the steering box.......has anyone experience of these or any other views? 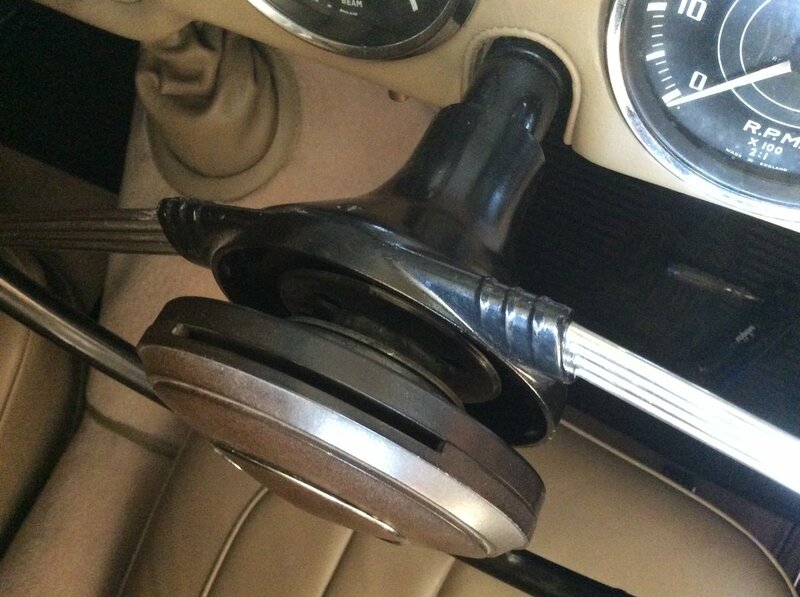 I want to retain my original brown bakelite horn push cover. PS I had to dismantle the control head as the indicator lever had broken off and fallen out. sorry to trouble you yet again. Steering is heavy on the sidescreen cars (very heavy compared to modern !) a very good steering box can have little detectable play, but most are worn to some extent. 1st check is that the adjustment on top of the steering box is correct. Lift both front wheels off the ground, & set the wheels dead ahead, then slacken the lock nut so that you can screw the inner threaded part up, or down. slowly screw it downwards while checking for tightness on the steering wheel, once it starts to bind, back off the screw a small amount untill steering is free again, then lock the screw in that position. then check from lock to lock to make sure there are no tight spots. If there are then slacken off the adjustment till they go. Having done that, & with the wheels back on the ground see if the slackness had improved. another thing to check are the various ball joints, the fixing of the steering box to the chassis, the rubber isolated connection between box & center tie rod. The condition of the steering idler should also be checked, but in my experience they are all a bit slack, & in fact this does not make an awful lot of difference. I have seen complete control heads on ebay from time to time, so that might be worth a look. Repair the Bakelite with JB Weld. Can you post pictures of the broken part? I have read that “Super Glue” can fix Bakelite, but if the bits are no longer there then no glue will work. Just like the human body, you can remove many bits, and it still functions perfectly! Thanks chaps. Looks like the best way forward is to replace the broken the control head and wiring Possibly with an aftermarket or second hand unit. Then refurbish the steering box as necessary. BTW, should the short length of metal tube which passes through the steering wheel be connected to the disks or simply be loose where the wires pass through? Pics attached. The short tube (with dimples) in your photo should be free to rotate in the disc with the three large holes in, but be fixed to the one behind. The dimples in the short tube locate in a slot in the top of the long tube which is left behind. This system prevents the whole head rotating with the steering wheel. just one last thing......I hope. 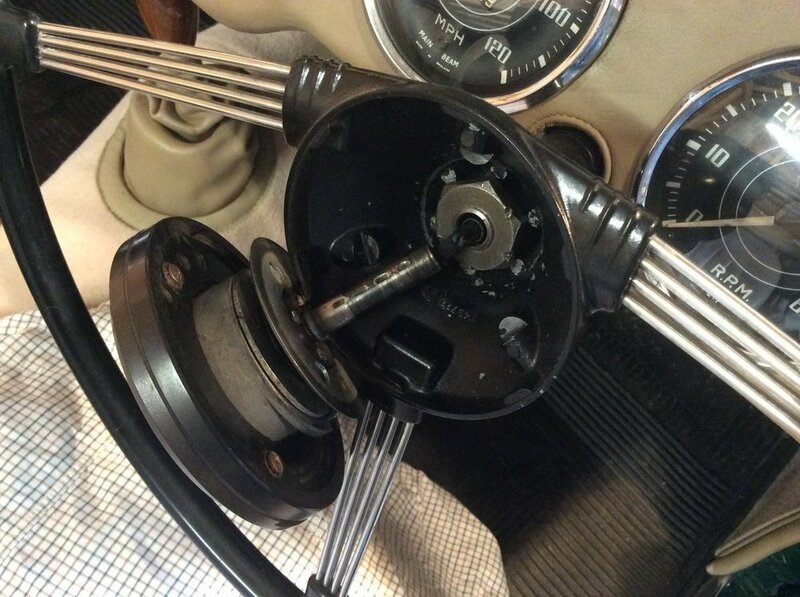 When I removed the two very long brass screws holding the horn push springs to the mechanism found they were floating loose and could not be tightened.......they appear to disappear into a void on the other side of the disc. Any answers. Sorry to bother you again. You may not even remember what lurks there. Those two screws that you have just removed have nuts on the back……. Those nuts will now be floating about inside the body of the assembly and the only way to get them back is to remove the rearmost part of the assembly. The large metal disc has three large holes in it. Line these up with the screws beneath them and remove the screws. You should be able to remove the large metal plate, along with the dimpled tube. The nuts should (hopefully) just fall out. This gets you access to the rest of the nuts where the loom wires go. There are about 20 pictures in total. To repair the Bakelite try this method before ordering repro one. Strip the base and collect all broken bits you can. lay them on a white cotton sheet taken from your wife's bedlinen chest. Kitchen roll works as well and less hazardous. clean the area with brake cleaner and bits on some kitchen paper. there was grease on moving parts when originally built. They must be cleaned well. use tweezers and super glue (preferably Gorilla Glue) carefully glue back together. Do this slowly don't rush it, allow the glue to go off!!! Finally, fully coat the repair plus 5-10mm over size and sprinkle the fairy dust (baking soda) to form a crust over the whole repair. Does this 2-3 times to build up a layer over the whole repaired area. If you do it right you can file, grind, drill and tap the final repair as if original Bakelite. you can use wet and dry to get a smooth profile and paint it if an external item. The resultant repair will be as strong if not stronger than the 50 or so year old unit. Try a few drops of superglue and drop a pinch of baking soda powder on to it and it instantly goes hard. Leave for ten minutes and them run a file over it to see how hard this stuff goes. For cracks file crack a little bigger, fill with soda powder and then drop supaglue which will set instantly so be sparing to avoid bridging, build up rather than try to hurry. Once you master it, this method works on many applications and allows restoration of original parts. The only limit is you imagination!!!! Warning!!! use examination gloves as the resultant fix will stay on you fingers or glue them till your skin parts or renews!!!!!!!!!!! NB The commercial version of this is QBond which has coloured powder instead of the baking Soda. probably just coloured baking soda! There are many videos on Utube about this method and even gluing metal. This may even be possible for non loading metal to metal where a hole/fixing is not desirable. I wrote the article on the overhaul of the control head in TR Action No. 62 and still have parts from several dismantled units so I may have the bit that you need. If interested please let me know. Cars Owned::My short door TR2 daily driver owned since 1976, TR6 daily driver owned since 2016 and long door TR2 owned since Jan 2017 undergoing restoration. Sailing my S&S34. I'd like to expand on what Bob advises here. It is critical with TR steering boxes to make sure the end float is correct before you do any other adjustments. End float is adjusted with shims under the end plate on the box, where the stator tube protrudes. You need to get it adjusted so there is no discernible end float in the steering column but you can turn the steering column with your fingers on the spline, no steering wheel. If this isn't right all other adjustments won't be right . Unfortunately, I don't know of a way to set this up with the steering box in the car. I can better describe how to do this but it will be lengthy to do it here. The 2nd requirement is to ensure the steering box is in the straight ahead position when the wheels are in the straight ahead. Unlike rack and pinion it is critical that the steering box is centred before adjusting the peg. Over time the tie rods can be adjusted so the steering box isn't in the straight ahead position when the wheels are. The best way to check this is to align the edge of the steering arm on the bottom of the steering box with the angle described in the manual. I do this by shining a torch down and aligning the edge of the steering arm with the steering column. Hard to describe but easy to do once you have figured it out. Now you can adjust the steering. If you don't do this first you will adjust the adjusting screw down with the steering arm off centre. When you move the steering through centre the steering can jam solid, I have done this many years ago. I have fitted the Revington spring loaded steering box top to both my TR2s. It is a very worthwhile mod as it keeps the peg firmly in the worm when cornering. As the peg moves away from the centre of the worm there is a lot of slack and the spring loaded top removes most of this. This is why you see TR drivers hunting with the steering wheel on sweeping bends. The other mod I did to my daily driver is fit the Revington bushes to replace the silentbloc ones. They take out a lot of play. I have a video of my steering on youtube. I made it to show the rack and pinion only brigade that the original steering works well if properly set up and maintained. The video was shot after about 20,000 miles with no work or adjustments to the steering. It is on a slight sweeping left hand bend. Agree with all John says above, (I forgot about the end float) I also have (my own version of) the Revington sprung peg, & nylon / stainless replacements for silent block bushes. makes for pretty much no free play in steering if all else is OK.
Wonderfull.......will let you know how I get on. I am late to add to this thread but I have read it all over the last few weeks. My indicators were cancelling well. I was overhauling the steering and I changed the steering box. When lining up the stator tube with the slot at 12 o'clock the full head assembly would not slide in correctly. If I move the stator by rotating it to the left to a new position, the head slides on and the cancellation works, BUT only at full lock. Nothing in the steering head has been changed. I rebuilt it years ago with a spare on the bench as a pattern. What has happened? It is the same head ,wiring, stator tube and steering wheel.